In a beautifully orchestrated chain of events that is fundamental to life and health, our bodies continually undergo mitosis—a process by which a “parent” cell divides, producing two identical “daughter” cells, which in turn also divide, and so on. When we are in good health, mitosis is carefully regulated to ensure fidelity and allows new cells to be produced as needed for both growth and repair of aging or damaged tissues. But when genetic mutations occur, they can lead to unchecked cell growth and proliferation—a hallmark of many cancers and birth defects. Understanding the molecular mechanisms that underlie these changes is the work of Arminja Kettenbach, PhD, an assistant professor of Biochemistry and Cell Biology at the Geisel School of Medicine. 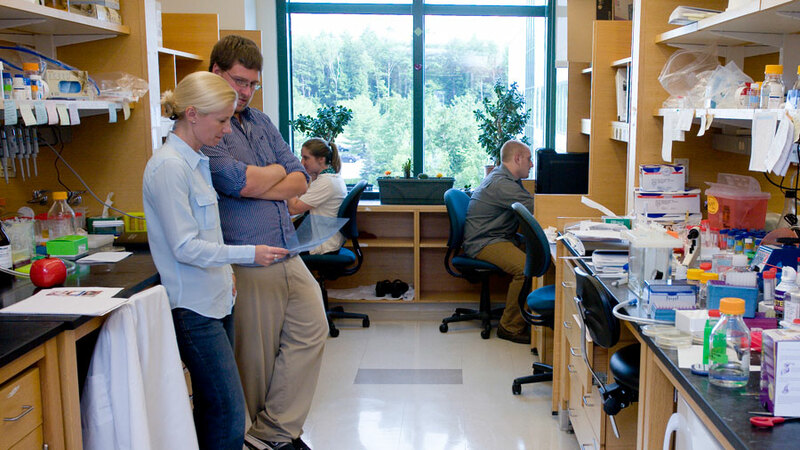 In the following Q&A, Kettenbach talks about two high-profile grant awards that she recently received, and the focus of the Kettenbach Lab, located in Dartmouth-Hitchcock’s Norris Cotton Cancer Center. Q: Can you tell us about the two grants you were awarded and how they will help advance your research? Kettenbach: The first is a five-year ($250,000/year) MIRA (Maximizing Investigators’ Research Award) grant—a new R35 funding mechanism from the National Institute for General Medical Sciences that was just started last year. It’s focused mostly on basic biomedical science and is based on the potential investigators have for pushing a specific research field forward. The MIRA is designed to provide more flexibility than traditional NIH grant mechanisms in the types of experiments and research questions investigators want to ask. The second is a two-year ($200,000/year) award from the V Foundation for Cancer Research. Their aim is to support young investigators on highly innovative ideas they have with regard to finding cures for particular types of cancer. Our project focuses on finding new therapeutic targets for triple-negative breast cancer. It’s a great honor to receive both of these awards. They’re going to give us more stability and breathing room, so to speak, in terms of allowing us to concentrate on research. They will also allow us to look into more difficult and perhaps more risky questions to see where that can lead us. We’re very excited. Q: How do you describe your area of research and what your lab is focused on? Kettenbach: Essentially, we are interested in understanding from a biological perspective how cells divide, and what goes wrong in cell division during cancer. We use advanced approaches in proteomics (the comprehensive analysis of proteins and how they are expressed), biochemistry, cell biology, and imaging to gain insights into the complex signaling networks that are involved in cell division. Specifically, my lab focuses on a critical process of cell signaling called protein phosphorylation, by which proteins get modified and regulated as part of cell division. There are two classes of enzymes that play a really important role in this: kinases, which “put on” a modification; and phosphatases, which “take off” a modification. It is the balance of these two counteracting activities that ensures mitotic fidelity. There’s been a lot of research done on the kinase side, but there’s much less known about the phosphatase side. Traditionally, the idea was that phosphatases were like “housekeeping” enzymes that only played a minor role. It turns out that it is not true—they are, in fact, highly selective and specific enzymes. In my lab, we want to know how these enzymes actually help regulate the progression of cell division. Our hope is that this will help to uncover new pathways for therapeutic interventions in cancer treatments. Q: What tools are you using to study this process? Kettenbach: We are using proteomics, which allows us to monitor on a global level protein expression—the abundance of proteins and also if these proteins are modified by phosphorylation. Using an instrument in the lab called a mass spectrometer, we can easily look at 8,000 to 9,000 proteins and 20,000 phosphorylation sites at the same time. This gives us a clear picture of the phosphorylation dynamics in cell division, and how sites react if we make a change, such as introduce a drug. Q: What do you consider to be your most important accomplishment to date? Kettenbach: It is, in fact, something that is quite technical. In contrast to genomics, proteomics is a relatively new technology. So a lot of our time is spent trying to establish new methods for how we can do things or optimize current methods. In our work, it’s very difficult to analyze whole proteins, so we break them into small pieces called peptides. While nearly three-quarters of all proteins are phosphorylated, after we break them down into many peptides only one percent of peptides are “phosphopeptides”—so we need ways to enrich for this population of peptides that have phosphorylation sites. During my post-doctoral research, I developed an approach to do that, which has worked out very well. Most proteomics labs worldwide have adopted it, and the approach has led to other developments in our methods. Q: What do you enjoy most about your research? Kettenbach: I love the fact that pretty much every day, we can discover something new and increase our understanding about cellular signaling and cancer. One of the great things about proteomics is that it’s a highly collaborative discipline. Because it’s so specialized and there aren’t that many labs doing it, we have a chance to collaborate with many other leading centers and researchers and support their work. For example, we have a lot of collaborators around Dartmouth, but also across the U.S. and even worldwide—including people from Canada, Denmark, and Germany. It’s very gratifying to be able to work with them and help them to understand their systems better from a proteomics point of view.